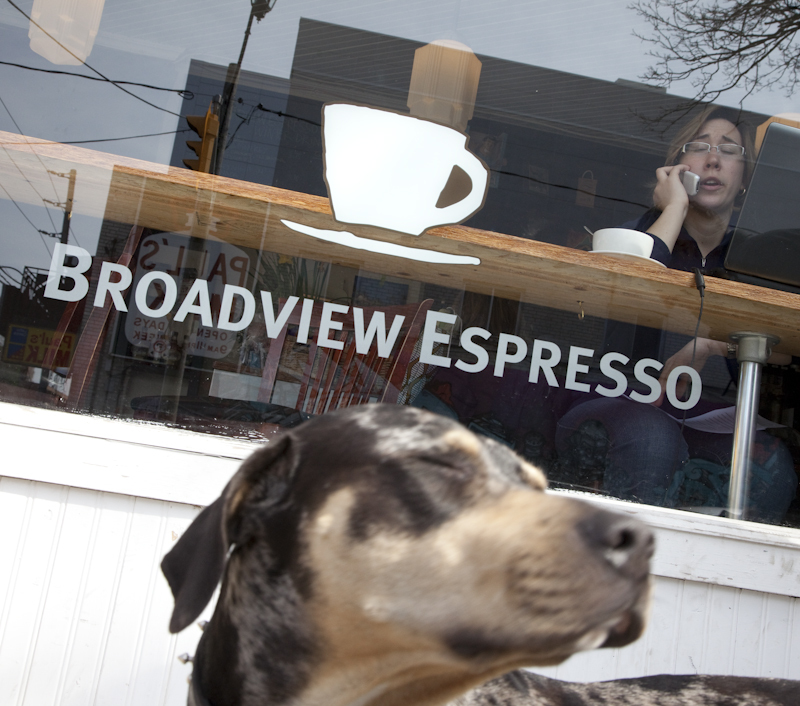 I’m a regular at Broadview Espresso (817 Broadview Ave; 416-553-3833) two blocks north of the Danforth. It’s right around the corner from Energia Althletics and there’s nothing like a latte after sivasana or a long morning run with Lea. Moreover, the staff at BE are very close to my heart. Why do I love their latte? It doesn’t hurt that their takeout cup for a double latte is larger than all the rest. But it’s what’s inside that counts, right? Barista Laura happily pulls an “extra hot” latte for me and the artist in her makes the prettiest decoration on top. Magically, their low-fat (1 %) latte doesn’t taste low-fat at all. The scones, muffins and cookies all come from a west end bakery called Circles and Squares (ditto for every shop below). The scones are butter incarnate, the pumpkin bread is rich, moist and memorable and the muffins just look so damn Martha Stewart all baked up in those tall, parchment paper liners. Owner Mike is a big supporter of the arts, hanging local exhibits on his walls and featuring live music once in a while. And because BE is on FB, you can check out their concert schedule on Facebook and become a friend. 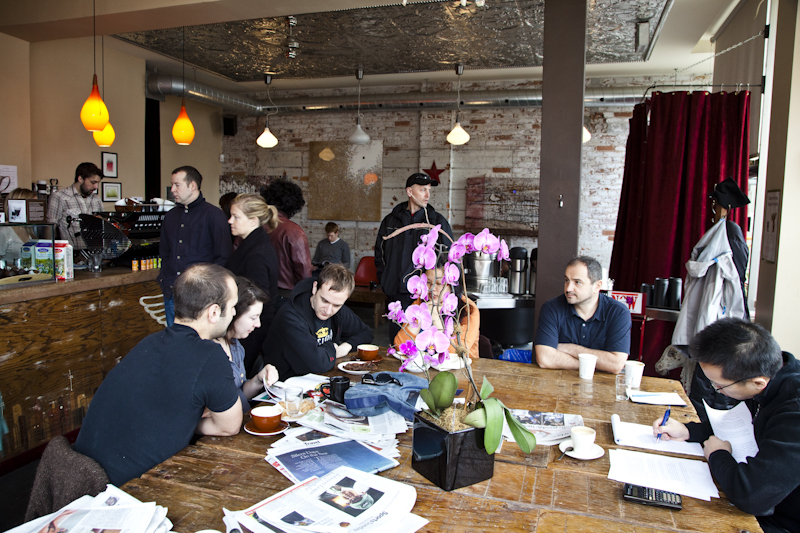 Rooster Coffeeshop (479 Broadview Ave.) is the new kid on the block, opening its doors just months ago. It has one of the most iconic views of the city’s scrapers, poised on the edge of Riverdale Park’s infamous toboggan hill. 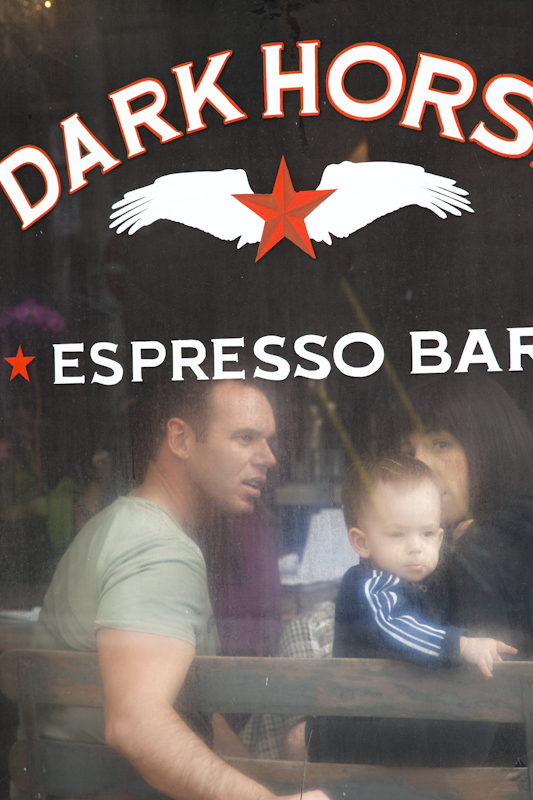 Sitting at a counter gazing out of Rooster’s huge, glass window, don’t chide yourself if a Red Bullet goes by and you heave a romantic sigh. The ambience here is so fine, it feels staged. Owners Dave and Shawn are both film set veterans and they’ve dressed up this former variety store with funky chandeliers, rickety stools for tables and the comfiest old leather chairs Elte ever made (and Sherway Gardens tired of). And the coffee here is exemplar: deep, dark and chocolatey. The beans are roasted nearby at Riverdale roastery TeAro but it’s the patisserie that drive me wild. Imagine a Danish (sorry, a current obsession) that is so light, crisp and buttery it crumbles when you look at it. Adorn it with cream and blueberries, or sliced plums and toasted almonds and you’ve got some of the finest specimens in town, care of Jules Cafe & Patisserie, 617 Mount Pleasant Rd. 416-481-1666. I love a treat but I do want my yoga pants to fit, so I’ve sourced out the antithesis to those French pastries at Dark Horse Espresso Bar (682 Queen St. E 647-436-3460). It’s called the Industrial Muffin and one look tells you why: it’s as wide as a coaster and weighs half a pound. This baby contains not a gram of fat but is loaded with raspberries, blueberries, seeds and what tastes like kamut flour. But, but, but… I’ve had varying success with the latte here. Sometimes it is bang-on, but not always. And that, my dear blog readers, is the crux of latte making. If it ain’t consistent, it ain’t worth the $3.75 each one of these vendors is selling their cup for. This entry was posted in Food talk, Photos by Donald Nausbaum, Restaurant reviews. Bookmark the permalink. I agree that consistency is the main issue if one is to become a regular at 3.75 a shot. I want to check out their caps and if they can pull a sweet shot and the milk is thickened just so by the steamer, it’s a winner. 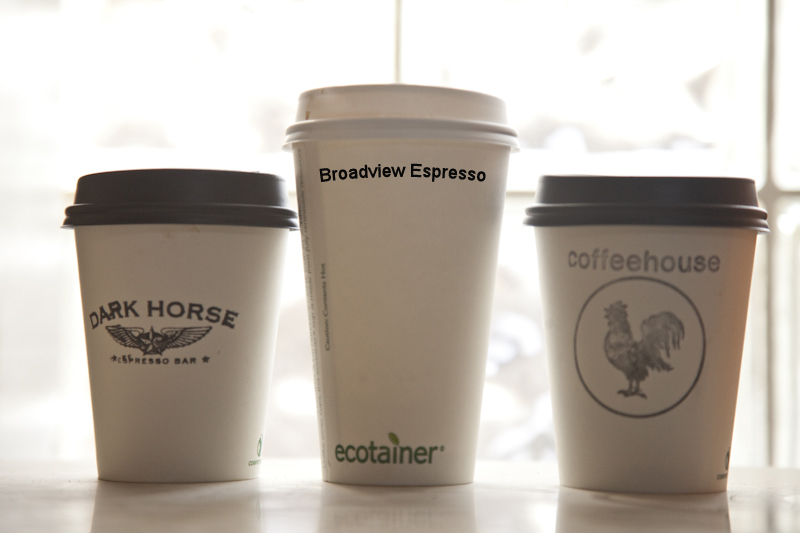 And what is the eco footprint of these cafes? I just had the best cappuccino outside of Florence on Oak Bay Ave., in Victoria BC, but I can’t remember toe name of it! Thank you, Madeleine, you’ve inspired me to make my next coffee meeting at one of these neighborhood finds. They sound like a nice change from the ol’ Second Cup. Love your blog…. love the coffee, katahoula and dumplings! Thank you for writing out katahoula. Maybe I can remember that now!! And I love your blog, Madeleine!! Thanks Janet. Hope to see you there again! Hey, some folks certainly do, each single day.